We were a little shocked this morning. Bill picked up the mail on Monday and left it at the Berean office for the volunteers that arrived early Tuesday morning. We had tub after tub of mail. By the time we had finished we counted over 600 envelopes that all had to be opened and processed. Thankfully we had a wonderful group of volunteers that not only came in for the morning they were needed to help after lunch in order to finish. 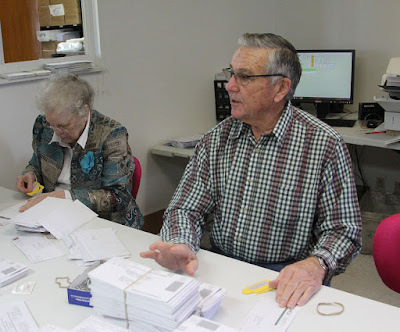 When I walked in a few minutes before 9:00 am Bill and Eva Jean were already getting ready to start opening the envelopes. Ron is always willing to do what ever is needed and today we really needed him. 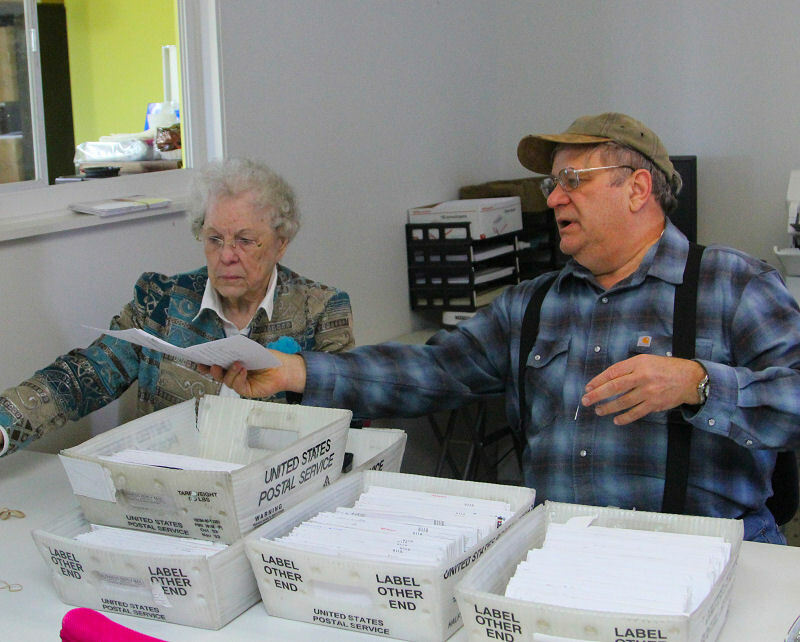 Vonnie does so many different jobs but today she was desperately needed to read letters. Behind her is Mark on the computer. We had 3 computers going today and were able to keep up only because of Mark on that 3rd computer. 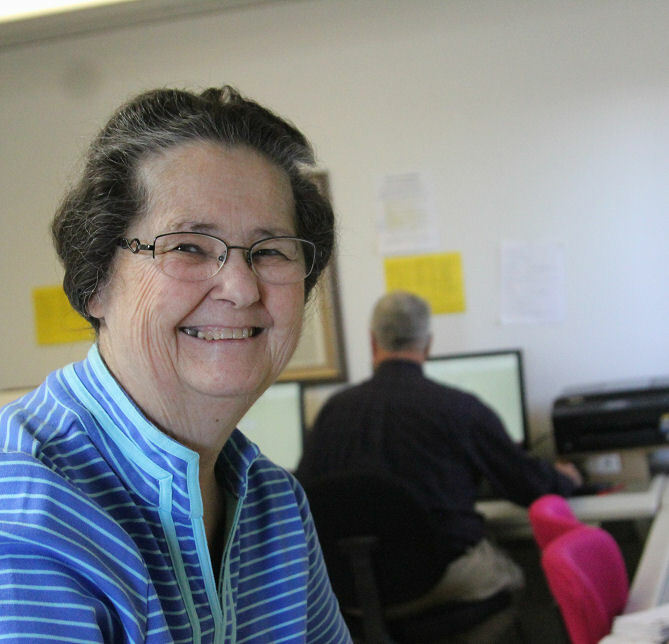 Our oldest volunteer here at this office is Gertrude. She drives here. She told me of course she drives she would never make it if she had to walk. She also takes home all of the silver series and grades them. Gertrude has always been such an amazing servant for our Lord. She was a missionary in one of the countries in Africa, living in the mud huts and teaching the natives about Jesus. We are thrilled she helps us now. Below Chuck is already at work applying labels. 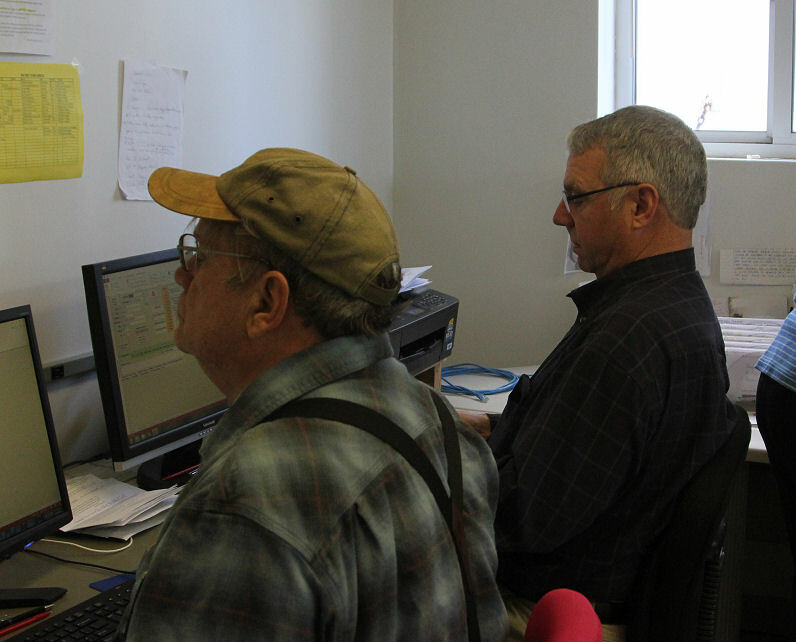 Mark and Bill had the first set printed by the time I arrived and when Chuck arrived he was put right to work. In the other room Robin, Joyce and Rhoda were also applying labels. 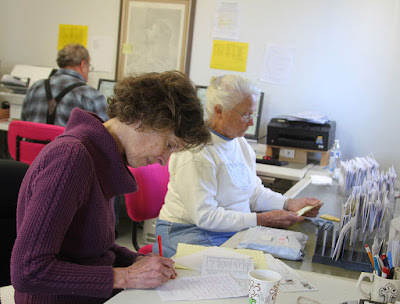 Jan was put to work stamping envelopes with our meter. That saves us time and 2 cents each. 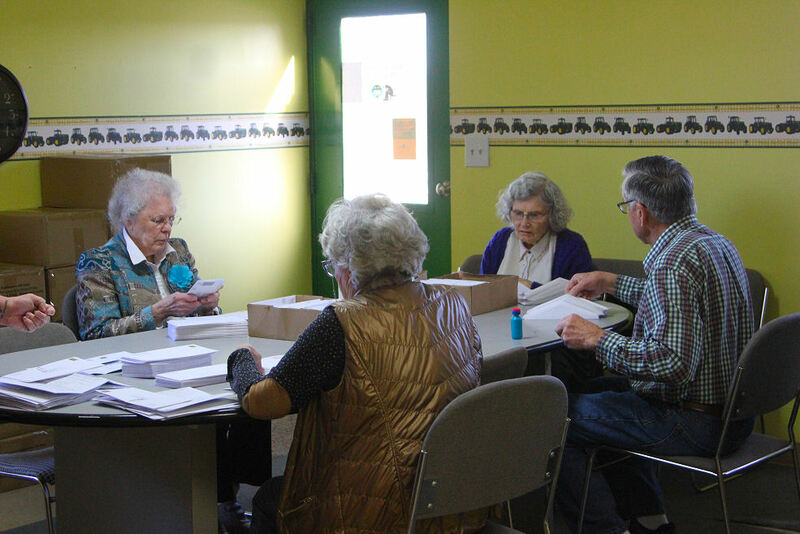 When the studies were all opened, Eva Jean, Gertrude and Ron joined Joyce and Robin in the other room for stuffing and sealing envelopes. Below are Bill and Mark who are busy entering data on the computers. Each study that is returned must be checked that the prisoner has not been moved and if they have been moved the address changed. 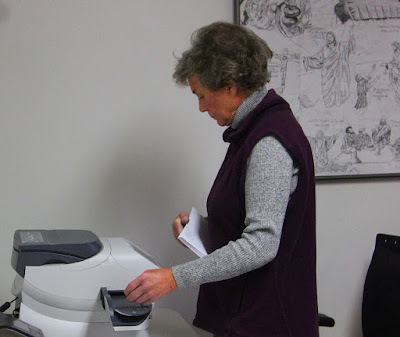 They also record what study the prisoner has returned and print off 2 labels for each study. One goes with the study to be graded and the other label is put on an envelope and the next 4 studies sent back to the prisoner. This sure generates a lot of mail that must be processed. 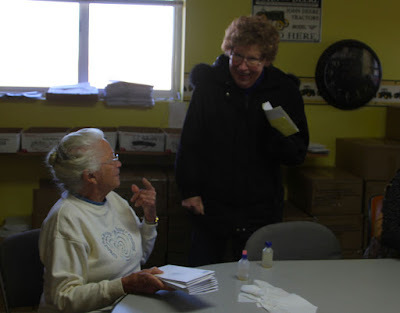 Rhoda was needed to help Kathy and Vonnie with reading the letters. 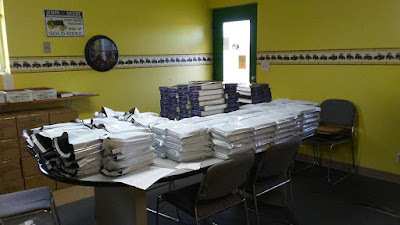 We got over 160 letters today with 157 of them asking for Bibles. Kathy brought the lunch today serving us piping hot pizza from Sam's club, an amazing crunchy salad, cuties, and a delicious peach and blueberry dessert. After lunch everyone went right back to work. 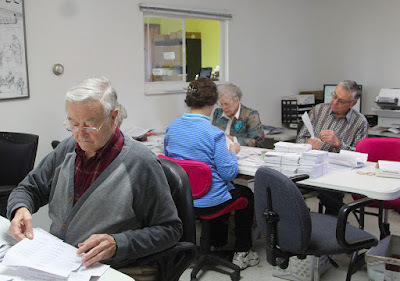 Below Joyce, Chuck and Vonnie are filling and sealing envelopes. 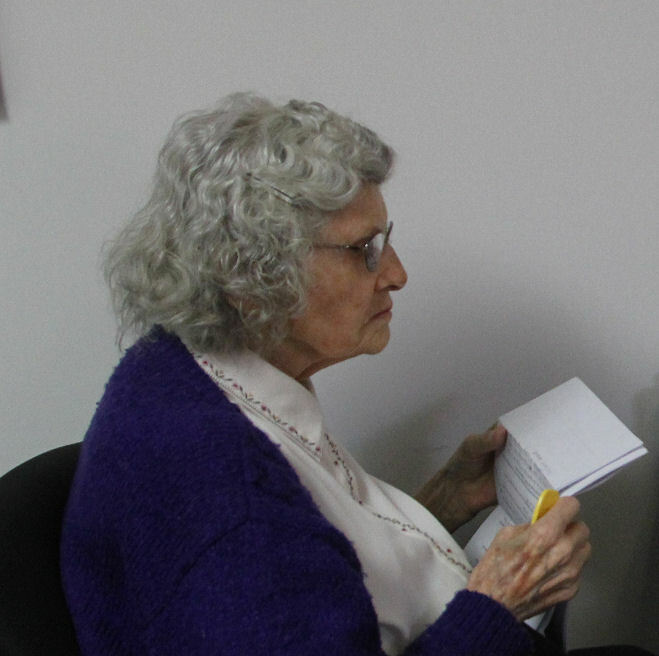 We got a visitor today, Darlene came today, she needed graduation certificates, Bibles and studies. Darlene and her sister Judy volunteer at the Sheridan Correctional center. 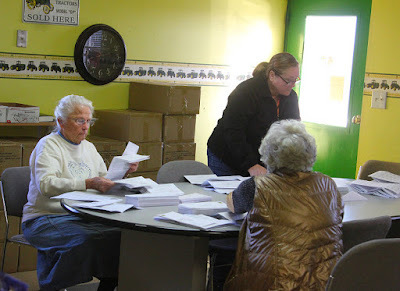 Most of us left around 1:30 but Robin kept working until almost 3:00 pm stuffing and wrapping the Bibles that will be going out in the mail tomorrow. Cindy, Robin and I will be back tomorrow to enter each of the Bible request on the computer and print out address labels for all the Bibles Robin got stuffed and wrapped. She certianly saved us a LOT of time tomorrow. THANKS ROBIN! And a BIG BIG thank you to everyone that came to help today. It really does take many hands to make this work load lighter.